I work with a lot of clients who feel ‘stuck’. What does that mean? For each client it is different, but in general, if you answer yes to any of the following, you are more or less stuck. Do you feel that someone is controlling your life? Do you feel that people are always judging you? Do you act in ways that are harmful to you? Do you wish to be more successful, accomplished or effective? Do you feel undervalued and disrespected? Do you eat out of stress? Do you abuse drugs, cigarettes, alcohol or time? Is your anger out of control so you hurt others without meaning to? Is it hard for you to focus? Do you feel anxious about performing well at school, work or in bed? Do you wish you were living a different or better life than you are? Ask around and you will find that just about everyone responds in the affirmative to some of those questions some of the time. It is this thing called Life. Life is complicated. And when you get fully involved in it, and particularly when you are involved with other people, you cannot completely avoid stress and a few unpleasant situations. People come to see me when the stress has become chronic and unpleasantness has become predictable. The negativity in their life creates limitations that prevent moving forward, hence the term ‘stuck’. I wish I could help clients with a convincing “Stop it!” But that doesn’t work in real life. Instead, I make a convincing case that, even though you may have given up hope, you do not have to remain stuck; the negativity can be reversed. Life does not have to be complicated; and un-complicating it minimizes your struggles so you can actually enjoy life. You don’t have to be a rocket scientist to make the changes you desire, but you do have to look at your life differently. It’s not just a matter of whether you look at the cup as either half empty or half full. You have to take on a whole new perspective. As you imagine that cup, your mind defaults to either half empty or half full. Some clients tell me what they think I want to hear, but an honest answer is preferable. Because the people who come to see me are stuck, it is not surprising for them to see the cup as half empty; but what does that mean? For example, let me share what the metaphor means to me. It tells the story of my life. For a long time, when I was younger, I was not aware there was anything in my cup. There was; but I did not recognize or value the gifts I lived with. Life’s lessons slowly opened my eyes to those gifts. I perceived pleasant teachers and high marks as good luck. My mother and father reinforced the notion that I had exceptional abilities, but I operated on the presumption of a cup that was half empty. Whatever I did was never good enough. I strove to be “better” at every turn. Ninety-nine percent on a math assignment was not good enough. I wasn’t satisfied until I uncovered the source of the missing 1%. Perhaps it was a Chinese thing. Yes, I strove for perfection, but I also needed to be better than everyone else. It sounds positive, but the underlying emotion was “I am never good enough,” and that feeling had consequences. 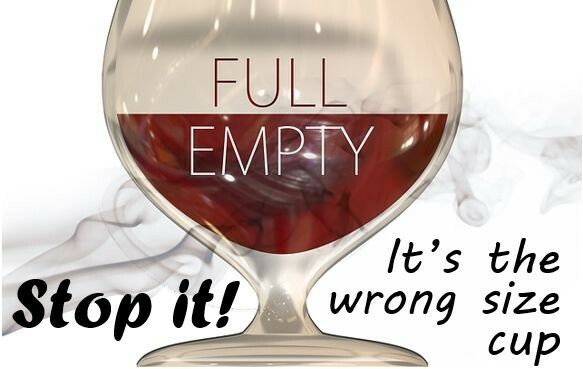 It took time and many hard lessons to reverse the perception of my cup from half empty to half full. Even then, it was a bittersweet feeling that the cup was “only” half full. So, once again I found myself looking for the missing 50% instead of enjoying what was already in the cup. The missing portion left a lingering sense of “never good enough.” I felt a little better, BUT not enough. I have learned to choose my cup; and whatever is in it, I can choose a size that runneth over. I have the power. I am in charge of my cup. Better yet, I can also choose not to have a cup at all. In so doing I merge with the Universe. I become the Universe and the Universe is in me. That means I KNOW I am good enough; I do not need to contain my power when making choices that determine my life. I know what true power is; as when the need to give is greater than the need to contain! Letting go is the golden key that sets me free to determine my own destiny.